In his best top fuel dragster impression, Matt Craig burned down the Hoosier tires on his No. 54 car after capturing his first career CARS Super Late Model Tour powered by VP Fuels win in the Leftturns and Sunburns 200 at Greenville Pickens Speedway on Saturday night. 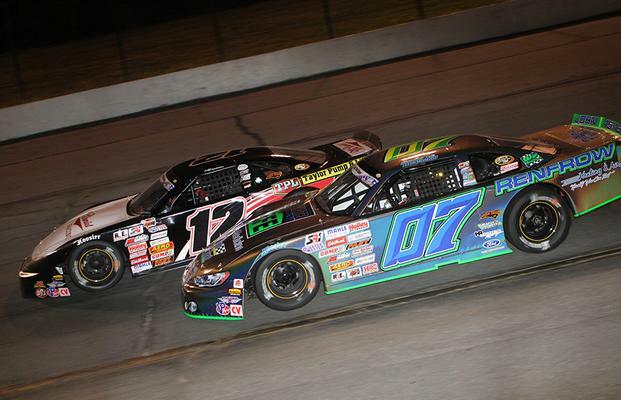 EASLEY, SC (JUNE 26, 2016) – Saturday night’s Leftturns and Sunburns 200 at Greenville- Pickens Speedway saw two drivers take home their first career wins in the CARS Tour. Tommy Lemons picked up his long-awaited breakthrough victory in the CARS Late Model Stock Tour, while Matt Craig cruised to victory in the super late model race. For the eighth time in his 15-race CARS Tour career, Deac McCaskill led the field to green and led the opening third of the race until Chad McCumbee took his turn at the point beginning on lap 30. A couple of late-race crashes, the worst of which eliminated Craig Stallard, Justin Carroll and Robert Tyler from the event, set up a series of restarts that ultimately played a pivotal role in the outcome of the 100-lap race. The final caution of the night for Will Burns’ wrecked car on the back straightaway put the No. 27 of Tommy Lemons to the outside race leader Chad McCumbee. When the green flag fell, it was an all-out dash to turn one, and ultimately the finish, with Lemons prevailing from the outside lane off of turn two on lap 92. Tommy Lemons captured his long-awaited first career CARS Tour win at Greenville Pickens Speedway on Saturday in the Leftturns and Sunburns 200. He led the final eight circuits after bypassing Chad McCumbee on a late-race restart in the late model stock car portion of the event. Lemons stretched his lead over the final eight laps to claim his first career CARS Late Model Stock Tour win in 15 career starts with McCumbee also finishing a career-best second. Dylan Hall brought home a third place finish in his debut with the tour, while Josh Berry and rookie Chase Purdy rounded out the top five. “This is a big win right here,” said Lemons in Edelbrock Victory Lane. “This is a brand new car and it’s only been run in the CARS Tour this year. We’ve been really fast with it in the race and have been struggling in qualifying and we finally got it figured out. It’s just bad to the bone right now. The CARS Tour Super Late Model Tour powered by VP Fuels event was all about Matt Craig and the No. 54 C&C Boiler Chevrolet. After rolling out as the final car in qualifying, Craig snatched the Mahle Pistons Pole from Cole Timm and led the field to green with Timm to his outside. Craig quickly shot out to the lead and began to control the pace of the event until the first caution of the evening flew on lap 19. Stephen Leicht lost control of his Jani-King Chevrolet while racing with Tate Fogleman on the backstretch and made hard contact, nose-first, with inside wall that ultimately ended his night. Another caution on lap 31 for Jody Lavender’s stalled car in turn two set up a restart that would be the lone test for Craig on the night. Soon after the field resumed competition, Harrison Burton discovered a way around Craig on lap 38. The lead for Burton was short lived, however, as Craig motored past Burton nine laps later and began to pull away on lap 47. Craig’s lead continuously grew over the final 53 laps. Cole Timm, Zane Smith, Brandon Setzer and Anthony Anders all surged forward late in the race as they attempted to chase down the No. 54, but their efforts fell short as the event went green to the finish and no one ever made a serious challenge to Craig’s dominance. 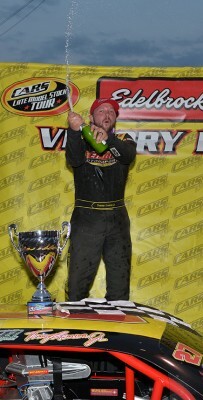 Craig cruised to victory with a 5.569 second margin of victory, the second-largest in CARS Super Late Model Tour history. 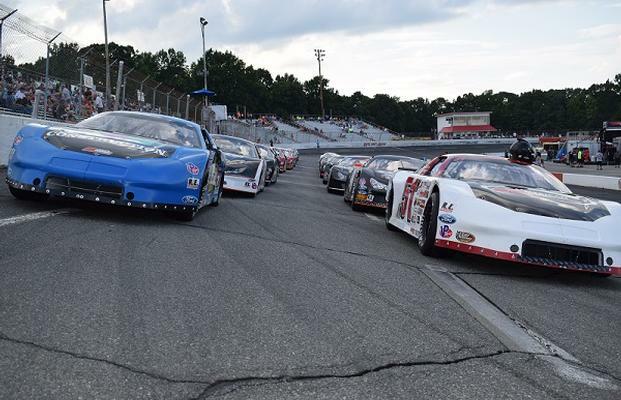 Timm, Anders and Smith were the next trio to the stripe, while point leader Raphael Lessard rounded out the top five finishers. “That thing was amazing. I can’t thank everyone who’s helped me enough, especially my dad for all the time he’s spent at the racetrack. I can’t thank Shawn and Jason enough and I really need to thank Clay Rogers and Gary Crooks,” Craig commented in Edelbrock Victory Lane. “There’s no way I’d be where I am today without their help, just how to drive them. When I first started driving these things, I didn’t like them at all and I was ready to go back to a heavy car like ARCA or ProCup used to run. They taught me how to drive them and with a little bit of luck, I’m just happy to be here. “When I was behind Harrison, I was just playing with him. I wasn’t even pushing it. I was probably running 10%,” he continued when asked about how hard he was using up his equipment. “Every now and then, I’d gas up and point inside of him a little bit to let him know what’s going on, but then I was riding and I was getting kinda bored. So I just hammered down coming off of four and passed him, it was a great race. Deac McCaskill’s Hedgecock Pole Award average is unheard of in modern motorsports. In 15 CARS Tour events, he has laid claim to the top starting spot eight times. Not only have the accomplishments been worth over $2000 in bonus money, but his pole-start average, to liken it to baseball, is .533. His overall winning average, however, is .133 after winning twice in his career, both coming at Southern National Motorsports Park. Greenville-Pickens is known for its history within short track racing and launching careers of the sport’s pioneers and legends. On Saturday, the CARS Tour wrote its own chapter of Greenville history with numerous drivers capturing their career best finishes in the event. Two super late model drivers captured their career best finishes (Craig, Anders), while no fewer than six late model stock drivers could make the same claim (Lemons, McCumbee, Hall, Purdy, J. Burns, Howard), all finishing inside the top ten. Chase Purdy was a nominee for “heartbreak of the race” in the late model stock car feature. While running third, Purdy suffered a flat tire during the lap 78 accident that forced him to come to pit road to change it. In the final 22 laps, Purdy knocked off eleven cars, clawing his way to a final finish of 5th. By unofficial calculations, the championship battles are quickly heating up as the CARS Tour crosses the halfway point on the season. On the late model stock side, it’s a three-way battle between McCaskill, Berry and Lemons, all of whom are unofficially separated by nine points entering race six. On the super late model side, Lessard leads Setzer, Houff and Timm with a collective separation of only 11 markers. In the spirit of hard-nosed, heated-temper short track racing, the CARS Tour leads the way in intensity-driven moments that have kept fans talking and has led to brewing rivalries. After 15 events in series history, the HANS toss tally has already climbed to three. Last season, Rich Gould started the trend after chucking his safety device at Clay Jones during an event at Orange County Speedway, while this season Justin Crider and Will Burns have both launched their own projectiles at fellow competitors. On Saturday, Burns’ wrath was directed at Crider after the two got crossed up late in the going at Greenville, ending with Burns’ car in the inside wall. All device-throwing incidents occurred either with safety personnel on-site of the accident or under red flag conditions.